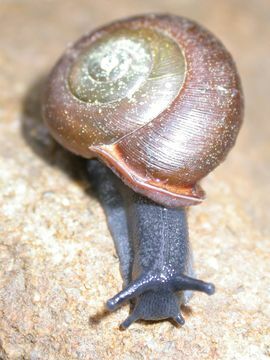 Inflectarius ferrissi, also known as the Smoky Mountain Covert, is a terrestrial land snail (Encyclopedia of Life, 2012). James H. Ferriss had collected specimens on a trip through the Smoky Mountains during the summer of 1897, and Pilsbry later described the species in 1897 (Solem, 1955). I. ferrissi is a highly isolated species with no close relatives known (Solem, 1955). It has a fairly large shell, in which the height is seemingly correlated with ecologic factors (Solem, 1955). I. ferrissi is very similar to Triodopsis dentifera in shell characteristics, but it has a distinct shell sculpture and genitalia (Solem, 1955). The home range of I. ferrissi has been relatively unaffected by mankind and is described as a species under natural conditions, rather than a species adapting to a changed environment caused by human habitation (Solem, 1955). Overall, I. ferrissi has a narrow range of tolerance of ecologic conditions (Solem, 1955). As you explore our website, you will learn even more about Inflectarius ferrissi. If you have any questions, please feel free to contact us. To do so, please visit the Contact Us page. To get started in learning about Inflectarius ferrissi, visit the Classification page. To learn about other species of Wisconsin land snails, visit the Wisconsin Land Snails Website. To learn about other organisms, please visit Multiple Organisms.